Server naming: Give your servers names that are meaningful to you - no more complicated server addresses and locations to memorize. Question: Can we have the default password? Answer: Thank you for your inquiry. This switch has secure and non-secure modes. The non-secure mode, which does not require a password, is the default. The secure mode requires an admin password be created and then entered to access the switch. So, unfortunately, there is no "default" password. 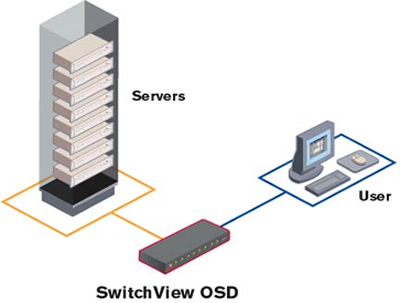 If the switch requires a password to access the OSD, and that password has been forgotten, you will need to contact Avocent Technical Support. Avocent safeguards the security of it's customers by not publishing password resets or override information. All password resets are done via a call to the Avocent technical support department after customer verification. Local Avocent support phone numbers can be found here: http://www.emersonnetworkpower.com/en-US/Services/InfrastructureManagement/CustomerSupport/Pages/CustomerSupportContacts.aspx.